I am currently building a 1/350 Atlanta class model as Juneau as she appeared in the 6/1/42 navsource photos. 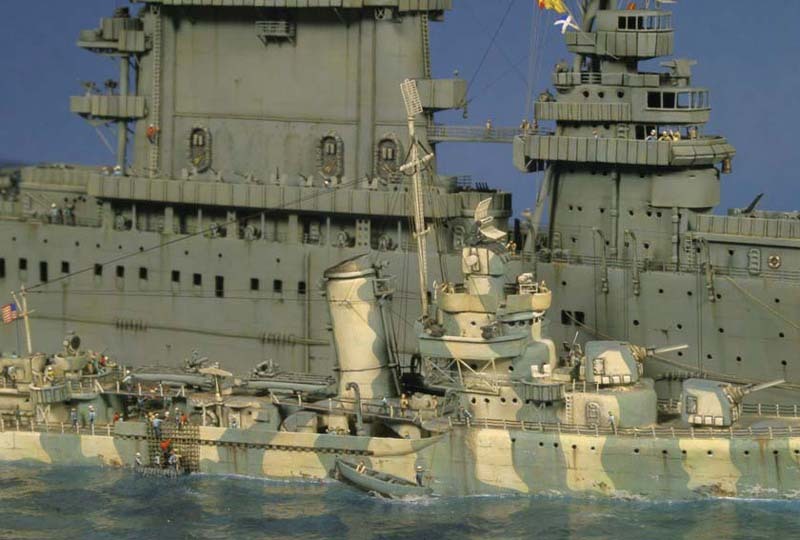 I can easily re create the hull camo in those and the Laffey photos by masking tape and the actual photos. The superstructure camo is another story. I have spare BWN superstructure units. I first tried drawing the pattern on by hand with pencil and hand painting it. Result is garbage. I am in the process of cutting the patterns from photos of the ship reduced to the size of the model with curved nail scissors, pasting those on top of masking tape, slicing the tape with an xacto knife, and putting the cut tape onto the superstructure unit.I can already see that once the superstructure units are airbrushed a lot of minute touch up by brush will be needed to get the end result more accurate. This is going to be one labor intensive process and even when oversprayed with clear flat the hand painted spots will probably be obvious at close range. So far I only have about 30% of the aft superstructure unit done. The forward superstructure patterns have even more small, complex curves in them. If anyone knows a simpler method for small, complex curve MS 12 MOD patterns please let me know. Computer assisted masks would be the ideal solution but I do not have the computer skill do do them. Silly Putty is one option I often hear for these complex curved patterns. Just mold into the shape you need. The curves are too small and too complex for silly putty. Airbrushed it the dark gray, gloss coated it, "painted" on the splotches with liquid masking film, airbrushed the light gray, removed film, dullcoated. The gloss coat is so that the liquid mask will pull off easily. Otherwise you're spending hours with tweezers and lots of swearing. I would honestly give handpainting another try. - Don't expect to get a smooth and covering result in one coat. You will need to apply several layers of well-thinned paint. Two or maybe three if you apply the darker over the ligther color, otherwise even more. Keep the paint well-thinned so it dries with a smooth even surface, and let each layer dry completely before applying the next. The first layer takes most time as you need to define the pattern and get the edges crisp, the next layers can be done a little faster. - Use fine brushes and take your time. Use really fine brushes to define the edges of the pattern, like drawing them with a pencil but instead using a fine brush and paint. Then fill in the insides of the shapes with slightly bigger brushes. Good quality brushes with soft, thin hairs are important for this type of hand-painting. Oh, and well-done weathering afterwards does help to make the paint surfaces look more smooth and coherent. But if you're worried about getting smooth surfaces on some of the larger areas, the liquid mask tip of Devin might work good too. I don't own stock in any company here, so I will say it's just an Excel product you can get lots of places. When you get the balance right (from practice) this little jewel will make those 'clouds' in 12 Mod easy to cut. The blade is small and has a curved edge on the flat blade that allows you to swivel the cutting edge around and make relatively short work of those funny, twisty shapes.